Ellen Perez has fallen one win short of a maiden Australian Pro Tour title for the second consecutive week after defeat in Brisbane. An in-form Ellen Perez was unable to cap off a stellar fortnight after going down in straight sets to China’s Shilin Xu in the Brisbane QTC International final on Sunday. The unseeded Xu started in style racing out to an early lead before Perez (No.8) was able to settle into the match, but it left her trailing and unable to recover the opening set. What followed in the next was a carbon copy of the first and while Perez did everything she could to stay in it – saving three consecutive match points on her serve – Xu held her composure to claim the title 6-4 6-3. “She came out strong in both sets, while I was a little slow. I felt my serve let me down a bit, and that was something I needed to do well to have a good chance against her, so I think just a few things on my end,” Perez, 22, said. After also making the final in Darwin last week – losing to Kimberly Birrell – Perez is still searching for an Australian Pro Tour title on home soil this season, but the level of her game will lift her confidence, as well as her ranking, which will now likely surpass her previous career-high of world No.235. 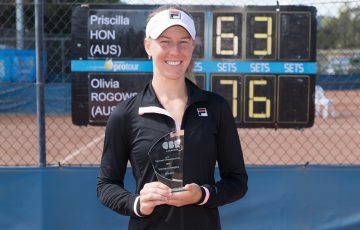 Earlier in the week, Xu was denied the doubles title as the unseeded Aussie pairing of Maddison Inglis and Kaylah McPhee claimed their maiden title together, defeating the Chinese and her Indian partner Rutuja Bhosale, the fourth seeds, in straight sets. 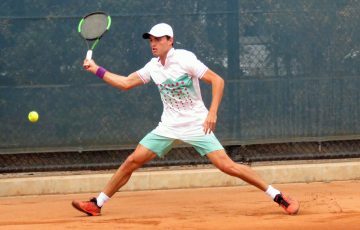 In the men’s singles final, Brit Evan Hoyt continued his impressive form on the Australian Pro Tour. 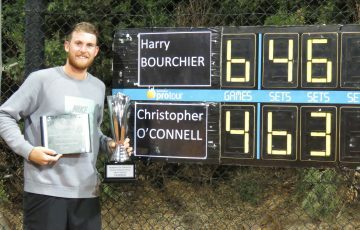 After claiming the doubles title in Cairns and reaching the singles final in Darwin, he took the Brisbane title on Sunday with a 6-4 7-6(5) victory over Colin Sinclair of the North Mariana Islands. A break down at the brink of defeat, Sinclair showed some tenacity to take the match to a second set tiebreaker, but in the end, Hoyt simply proved too strong. In a replica of the men’s doubles final in Darwin, top seeds Brydan Klein of Great Britain and Scott Puodziunas started well but were again edged out by No. 4 seeds Jeremy Beale and Thomas Fancutt, 2-6 6-4 [10-6], who earned themselves consecutive titles.